California Neon Products was established in 1939 by Ward Taylor and his son Guy. The first signs were produced in a small 2nd story shop in downtown San Diego. It wasn't long before business growth required the company to relocate to a larger facility on El Cajon Blvd. During the next several years the company continued to grow and in 1951 a major boost to the business came with a call to Guy from an old friend who wanted signs for his new concept drive thru restaurant, Jack in the Box. At the time Guy thought it was just another job, however, by 1957 another new facility was needed to accommodate the growing business and the company was moved to its current Mission Valley location. 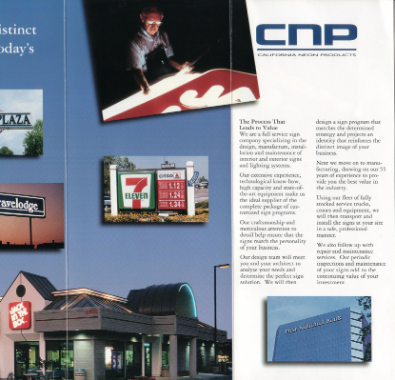 Throughout the years, the company continued to evolve and in 1993 after more than twenty years with CNP, Peter McCarter, Guy's son-in-law took over day-to-day management until his retirement in 2003. At that time Guy's grandsons, Robert and Rick McCarter, took over operations and continue to run the company. As the fourth generation management team, they carry on the tradition of quality and innovation in the sign industry. 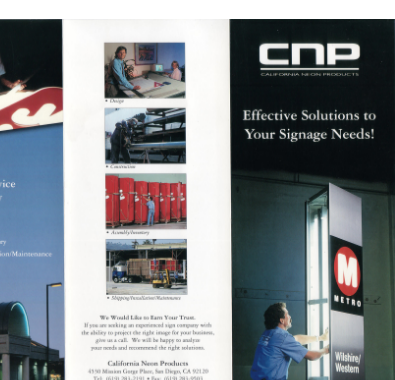 In 2006, California Neon Products became CNP Signs & Graphics in order to more accurately portray our services. After 60 years our name may have become outdated but the key values of superior quality and unsurpassed customer service have never gone out of style. CNP Signs & Graphics continues to look to the future realizing that our industry is in a constant state of change. Our dedication to proven technologies, as well as the utilization of the latest manufacturing methods, provides quality products which will continue to be the mainstay of CNP Signs & Graphics.